Tag Line: "They chose to protect her. But forgot to guard their hearts." Summary: Vigilance. The mission to safeguard Nikki Youngblood depends on the fragile alliance of two half-angel, half-human guardians, both struggling with intense feelings for the girl who has been assigned to their care. Mace, steadfast and deeply in love, wants to protect Nikki at all costs, while Raven's loyalty to Nikki finds him advocating for her independence and battling his own darker inclinations. At the same time, Nikki finds it harder and harder to choose between the two heavenly beings she may never have. Dangers intensify, and tensions between Mace and Raven flare as the purpose of their mission becomes clear. Can their defenses hold up to master manipulator Damon Vessler and the powerful secret he holds regarding Nikki's heritage? Can anyone protect Nikki from her true purpose and destiny? What I Loved: To be honest, I wasn't really that overly crazy about Guardian, but The last 4 chapters of Guardian were awesome and fully redeemed the series for me. But...I can't tell you what *AWESOME BIG THINGS* happen in the last couple of chapters because they contained HUGE SPOILERS. Also, the writing was just as great as always, despite the plot seemingly being m.i.a. What I Didn't Like So Much: Guardian started out extremely slow, for me. I mean, it literally took me 5 chapters in before I even got remotely interested with the story at all. Also, the plot, which was excellent in the first book, was utterly lost and drowned out in a sea of emotionally confused characters who, weirdly enough, were happily entwined in a disappointing love triangle. Nikki didn't really seem to care about anyone other than herself either, which caused me such grief throughout the book. Often it seemed as if Nikki didn't mind dragging Mace and Raven's feelings through the mud at all. I mean, I honestly just wanted to shake Nikki for stringing along Mace and Raven the whole time. And I wanted to shake Mace and Raven too, and tell them to man up already! Honestly, what kind of a man would just stand there and let a young woman give them a proverbial "heart beating" and not care if she chose the other guy over himself or not!? Seriously!? No guy I know would stand back and let the young woman they truly love rule the situation, AND their feelings, and then just let the young woman calmly walk away with their ripped-to-pieces-heart in her hands. No, that would never happen in real life. If the romance in the story was more like that of a real romance Mace and Raven would've fought over Nikki and would've ultimately taken charge in the midst of the complication (ahem, love triangle) themselves and not just let Nikki run over them like they were pitiful beaten down doormats or something. That said, I *normally* do like a healthy dose of romance, or even a well done love triangle (think Christine/Raoul/Phantom...because those men were manly and didn't let Christine jerk 'em around!!) in a story, but the whole Nikki/Raven/Mace love triangle had me sick to my stomach, frustrated beyond belief and quite baffled most of the time. Honestly, I wanted to know more about Damon Vessler, the Hell Hounds, the Demons, Nikki's abilities as a Seer and the Omega Corporation, more than I wanted to know about which halfling-of-the-moment wussed out and let Nikki string them along for the I-just-can't-decide-between-you-two-hunks train. I think this book relied on romance, and not the glorious plot set up in Halflings, a little bit too much this go around. So, here's to hoping that Avenger can shake Nikki, Mace, Raven and the others up a bit more to the realms of believable romance and reality. In spite of everything I am still looking forward to reading Avenger to see how the story plays out. I mean, the last 4 chapters truly blew my mind, so I have to read the last book now, you know? I really wish that the way the last 4 chapters had read would've been the route that the author would've taken with the entire novel. If the book would've lost the cheap romance I certainly would've given this book a couple more stars, but as it stands I only "kinda liked" the book and would give it a 2.5/3 star rating. I'm Recommending This Book... 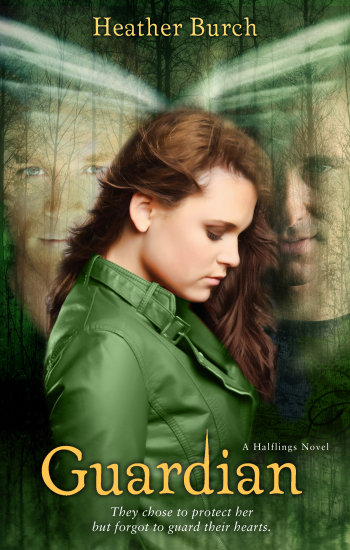 If you read Halflings, the first book in the Halflings trilogy, and you want to see the story through to the end then you'll most definitely want to read this one too. About The Author: Heather Burch grew up in Branson, Missouri, where she learned to love fiction. She then married into a family of published novelists and quickly learned writing was her heart's desire. When she's not working on her latest book, Heather can be found watching a sunset at a beach near her home in Southern Florida, along with her sons Jake and Isaac, and husband, John--who is her hero in every way.